Sometimes, you can see details on artifacts that indicate how they were formed or finished, it is one of the coolest things about originals for me. 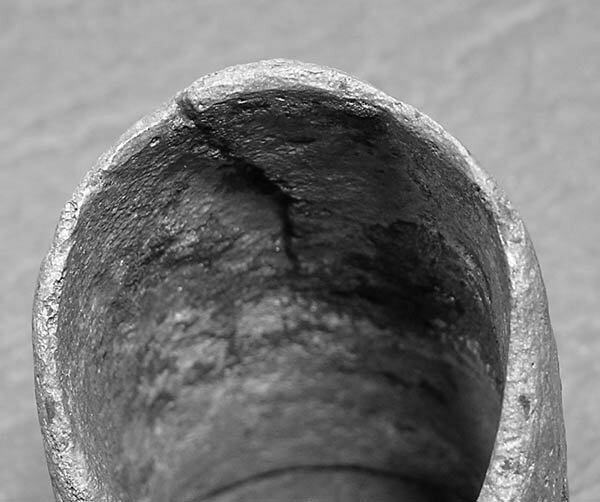 First up, a seam on an axe socket. 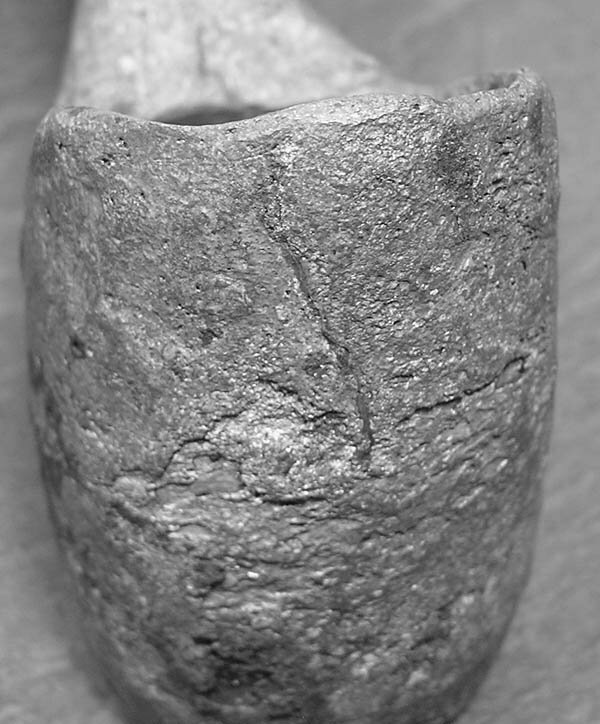 This is a roughly 10th century wood axe from Slavic or Baltic territories, with a nice overlapped forgeweld on the back of the socket. Depending on what the smith had for starting material, this could be a more efficient way to get a socket made; it could also be a repair technique. 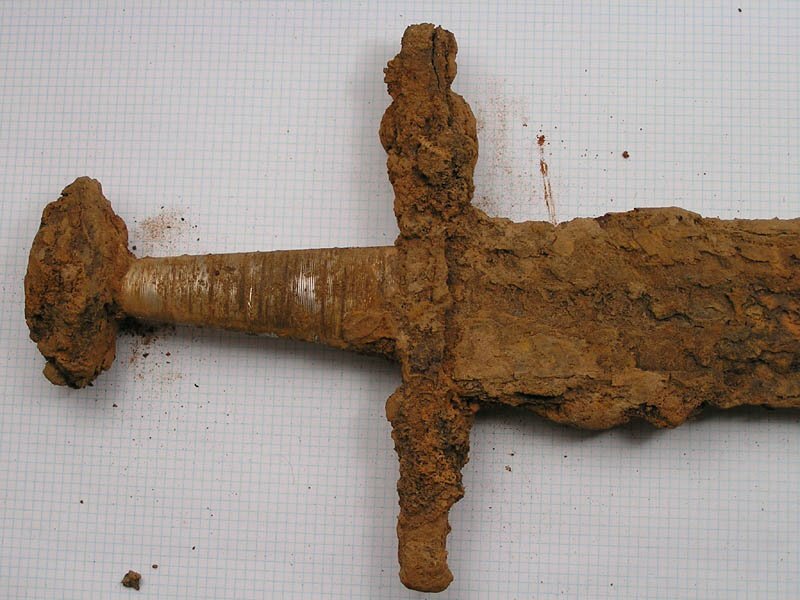 This axe does not look overly thin-walled so I suspect it is original construction on this one. 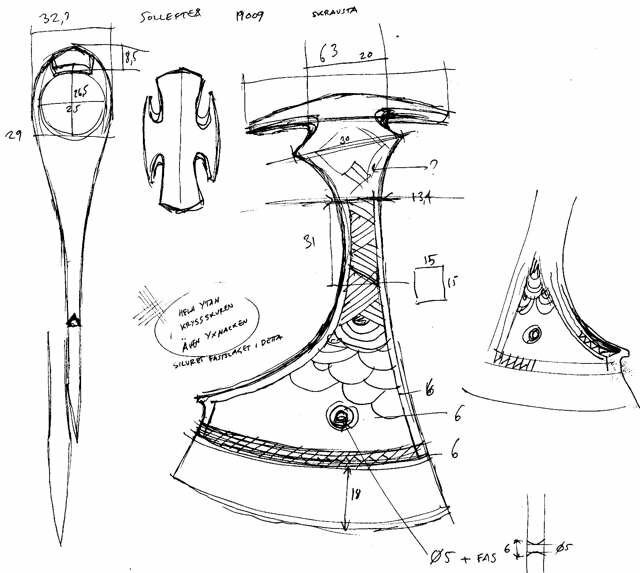 Next, a fighting axe from Latvia, 9th-10th century, with the back stave welded on as a separate piece. Kolcin the Russian archaeo-metallographer looked at one or two of these and found them to be forged out of a single block of steel, but this one is clearly assembled from various pieces of wrought with a steel edge. The axe head is something I especially appreciate. I made some sketches while visiting the national museum in Vilnius. Beautiful axes. Some of exactly the type you posted the close ups of the eye. I did a tracing of it many years back (with the axe on the paper and a soft pen drawing around it, so the lines are fairly accurate). Perhaps you can print it in scale? The edge is some 92 millimeter from corner to corner. The measurements on the neck spur seems off to me. in the drawing I have noted 63 millimeter for the width of the neck. Taking this measurements from the drawing it look like 67 millimeter. Width of neck in the "bays" between the cut outs are set as 20 millimeter, when it looks like 25 when I check it. Haft hole is 26.5 millimeter high and 25 wide. Hole through balde is 5 millimeter diameter with a "countersink" of 6 millimeter diameter. The whole surface is cut with very fine criss-crossing lines and the silver is inlayed Coftgari style. Even the back of the neck is cut like this but no silver remains today. Backside is slightly different in pattern. ...And here are two axes of slightly different type- The top one has the same type of neck/eye. from the National Archaeological museum in Vilnius, Latvia. I did not trace these directly, but drew free hand, so accuracy is not all that great. I did my best to capture character and proportions. I guessed length of edge. It is noted in centimeters in the drawings. The bottom one had the extreme end of the spur/langet missing, so we cannot know what form it had. 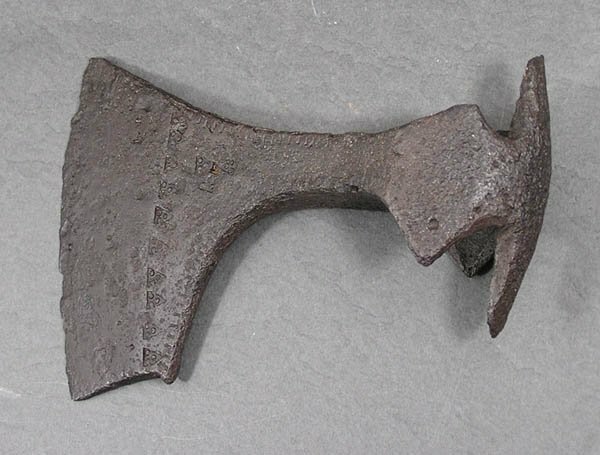 I have seen an axe found on Gotland that is contemporary and of same general type that had a fleur de lys/ lilly forming the end of the spur. Perhaps this one were similar? Excellent work, gentlemen. Jeff, thanks for sharing. Peter, those are fantastic drawings. What's the leading opinion on the purpose of the hole in these axe blades? I am in awe of those axes. The hole: I have not heard an explanation for that feature. 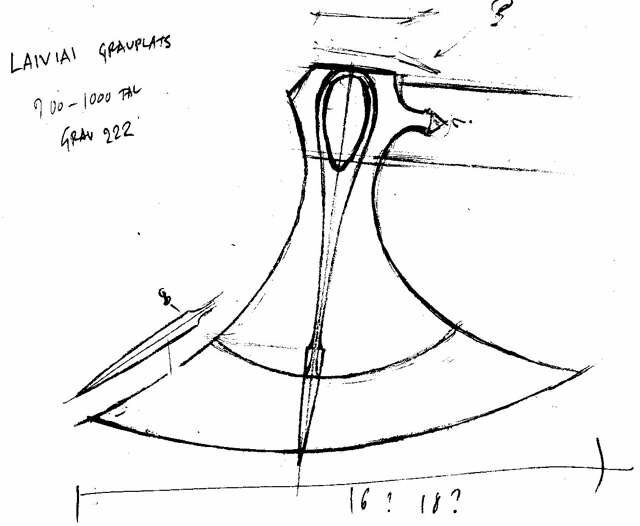 If I were to guess at a functional explanation, perhaps they are an aid in deciding length and shape of the haft? If you hang the head on a peg through the hole and tie a string with a plumb bob from the same peg, you could get a reading on the axe haft indicating when you have adjusted the length to proper dimension. I was gonna guess thong-hole, or place to hang it from a nail in your house. Maybe some form of mounting in a shield. Thanks for the excellent drawings, Peter! 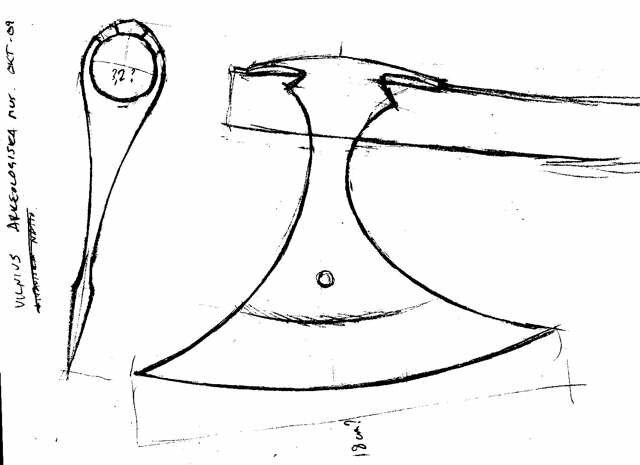 The blade piercing is mentioned in some of the literature on these axes, Kirpicnikov in “Древнерусскoе oружие” says it was used to fasten a fabric cover to the blade, and also that it was used for hanging the axe on a saddle, indicating thereby that it was a horseman’s axe. He goes on to say that not just warriors rode horses, some working axes also have the hole, and that it was not a mandatory element of a military axe either. They occur in 15% of surviving Russian military axes (78 of 494) (His book covers the 9th to 13th centuries). Kirpicnikov and Paulsen (in “Axt und Kreuz bei den Nordgermanen”) both mention that the hole is the subject of much speculation. Might it be coarse file or stone before final heat treat that left patterns in martensitic formation? Never seen a structure like that so clearly exhibited. I got to hold this one, and it sure looked like file marks to my uneducated eye. This is a small spear, 24 cm OAL, so by an educated guess it is made of iron, with no steel. It may well be a file finish, there is a hint of regularity in the spacing of the lines that would probably not be there if it were stoned; I was thinking when I posted the photo that it would have to be a mighty fine file to create that texture, but one should never underestimate our fore-forger’s ability to work small. On a different spear, I noticed what seems like the bite of a file on a smooth area that escaped heavier corrosion. It looks like that last little mark that takes so long to remove when you are trying to finish a piece off… perhaps a clue that the surface was finished to a fairly high degree. Interests:General blacksmith with an intense interest in steel making and swords of various periods. I have a photo in one of the Scandinavian books here that shows a large rock by a stream which has been worn to a large "V" shape due to rubbing from something over a long time period. The caption translated to something like "place of grinding"..there was also evidence of a washboard "slide" for the separation of ores....like making your own iron sand or some such by dumping the stuff upstream and collection the heavy bits on the long slob of the slide which had grooves in them. I heard tell of an original finish on a Viking sword which looked a bit like 400 grit scratches with no etch....I think Kevin Cashen can fill in the details. They occur in 15% of surviving Russian military axes (78 of 494) (His book covers the 9th to 13th centuries). 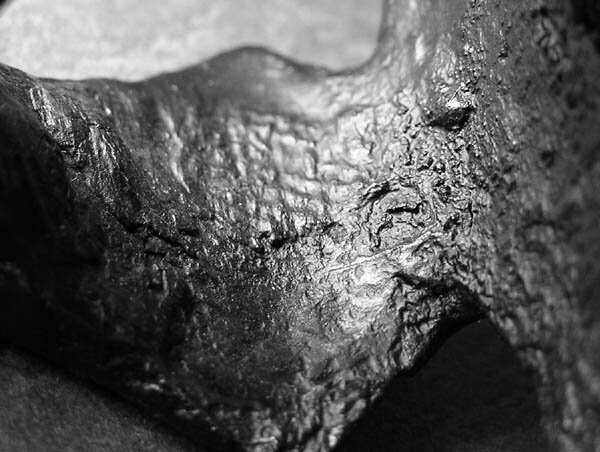 In presenting the iron finds from Haithabu, the settlement material form the largest Viking Age settlement in northern Europe is being made accessible. A total of 9606 findings in different studies in the years 1900-1980 Haithabu have been recovered. Of the thirteen functional groups and property tools, raw materials, weapons and trappings are mentioned as important groups. The focus of the investigation is on the crafting of the tools and equipment. 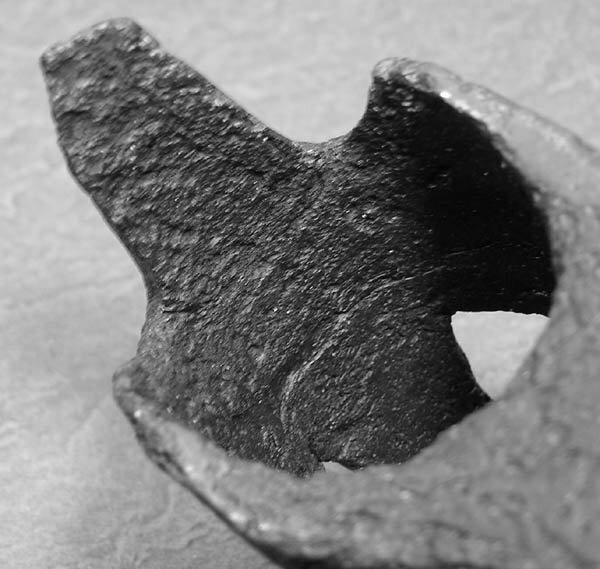 The remains of sliding weight and fine scales are suggestive of an active trading activity. For negotiating the sea Ösenbarren Norway can be identified as a production area. Particularly numerous are spears and arrows represent and spores. In addition to Carolingian and West Slavic finds mostly come from Scandinavian forms. 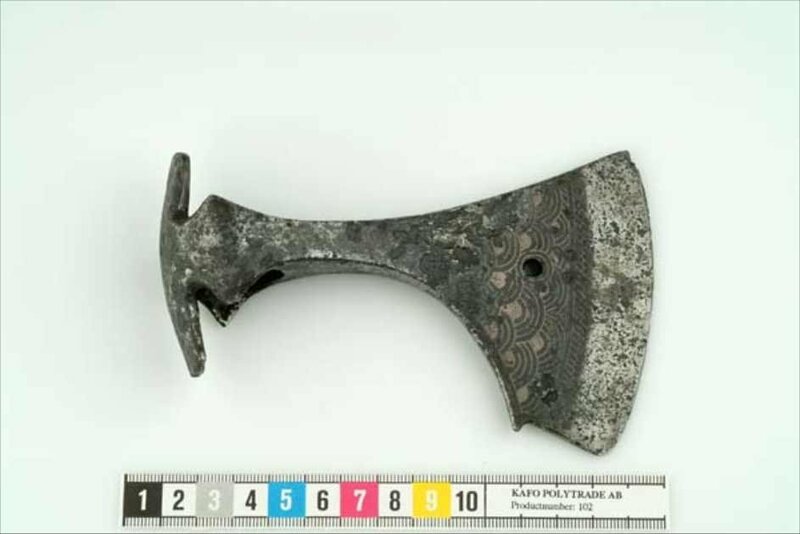 In the group of axes can also find tools Scandinavian battle-axes, battle-axes from the West Slavic area and axes Finnish-Russian, Russian, Baltic and Volga-burg African origin are detected. The time frame covers the span from the 2nd Half of the 8th Century to the 11th Last century and some artefacts from the 12th Century. I am going to pick up a copy when I get to Germany in two weeks. These grinding stones has been the subject of much speculation over the years. Some call the sword sharpening stones. Other name the marks grind troughs. Some have sought to find astronomical meaning in the direction of the marks. 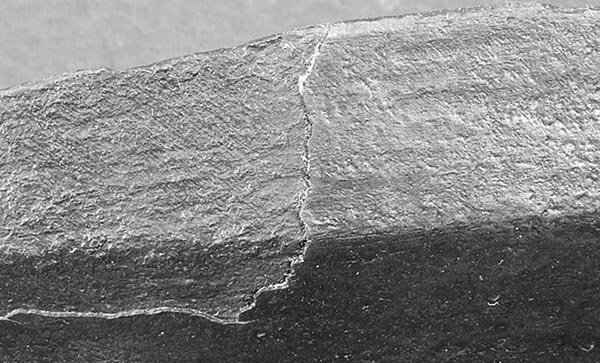 One such grinding mark is ground into the the face of a Gotlandic picture stone (viking age), obliterating part of the image. I have seen many of these myself and they do not look at all like something you could apply a blade to in any meaningful way. They can be pretty deep and sometimes have a steep radius almost as if they have been shaped with a wheel: a blade would have to be bent into a semi circle to reach the bottom of some of these groves. No one has been able to give a satisfactory explanation as how swords were sharpened or polished so that such groves would result. Some stones are situated by water. Many are very close to village churches. These are rural phenomena and not close to any place one would think in terms of martial importance or manufacture of iron or swords. 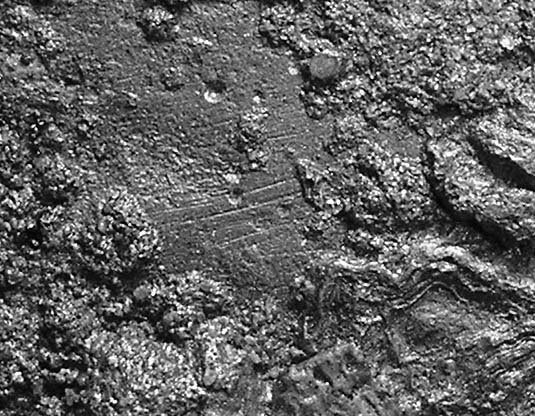 One researcher did some work on these and asked a local farmer what he knew about these sword sharpening marks. The farmer told him: -"well, I don´t know much about sword sharpening, but in the old days we trued up our honing stones (use for sharpening scythes) on these stones before we went out on the fields to mow down the crops." To me this seems like the best by far explanation. It also goes well with locations and the fact a viking age image was made long before the mark was put into the stone. A bit OT but perhaps some fun trivia? Well phooey to me then. Is "Die Eisenfunde von Haithabu" by Petra Westphalen loaded with pictures? My German is nicht so gut, but pictures are usually in English. 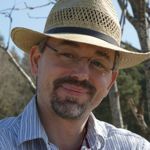 Jeroen put me onto the book by Herbert Westphal "Franken oder Sachsen? : Untersuchungen an frühmittelalterlichen Waffen" which has enough good photos of stuff I have not seen to make it worth the money. I have a Frankish throwing axe and an "newer" axe head from medieval UK...they are both wadded up from many small bits. I'll see if I can get some photos before they rust away. Jeff, this is an interesting coincident. I am looking at some swords of the same general type, comparing proportions. You would not know the measurements of this sword? Do you have access to any full length photos? Is the blade preserved to full length? ...But oh, what a grip!